Specially selected casks from the first distillations at Isle of Arran distillery (b.1995) make up this limited release of 2784 bottles that was released in 2004 and is hard to find today. Gordon Mitchell, distillery manager from the beginning, retired this past summer (2007) and was commemorated with the limited release Gordon's Dram. He has been replaced by James MacTaggart, formerly of Bowmore. We all hope that success continues to come to Arran, that the spirit remains as tasty as it has been throughout its young life, and that the peated version(12ppm) of Arran that has been produced for the past three years will continue long enough for all of us to try some when it is ready. 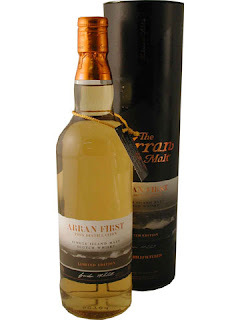 For all bottles from Arran had on the mission and for more distillery info click HERE. ** - price likely to be higher if you can find this bottle. Apples, pears, some green chillies and butterscotch. Malt, oat cakes, and spice. Hard to describe the pepperiness, but it is crisp and vegetal. Sweet and light, with the tree fruits above now cooked. Some nuttiness, too... hazelnut paste, Nutella. Salt, earth and cinnamon. Fresh and creamy with some woodiness like a sauna (cedar). Light but pungent. Quite an invigorating nose.The Arran bottle reads, "the result has surpassed out expectations." Indeed, this drop is well-balanced and wonderfully promising. We continue to be charmed by the young Arran Distillery. The dress shirts I now favour have "Gordon Mitchell" on the inside label. Well made, comfortable, classy - just like a fine dram of whisky! Perfect for wearing when drinking whisky, too.